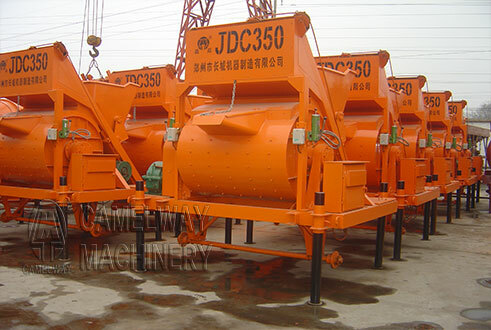 JDC350 cylinder concrete mixer series JZC350 concrete mixer, mainly by the mixing barrel, feeding mechanism, water supply system components, such as the Great Wall built machine engineer here in detail for the general customers, and give reference price! Mixing barrel is JDC350 concrete mixer’s main working parts, design for double tapered structure, cylinder inside have two pairs of blade, a cross is decorated, respectively, and mix the cone axis to form a certain Angle;Mixing drum rotates, adhered to the mixing drum blade makes the material implement improvement and whereabouts, at the same time also to churn, back and forth along axis of material so as to realize the mixing of concrete material.350 general drum mixer mixing cycle in 35 ~ 45 seconds.350 drum mixer is portable type mixer, so the mixing drum is supported by four wheel, mixing barrel through the motor drive reducer drive gear ring spinning. JDC350 drum mixer feeding mechanism composed of hopper, gym, take long track and ground track system.Into the hopper of the lift and climbed over action by gear reducer output shaft through the shaft end feeding clutch and cable drum, the clutch is controlled by manual control lever.Hopper limit position by the spacing device, automatic release the clutch. JDC350 drum mixer water supply system is composed of motor, water pump, valve and pipe.After the motor power supply system, water pump the water can be injected directly into the mix, and through the control valve to regulate water flow, operation is very simple.